Received this book as a Christmas present from my sister. 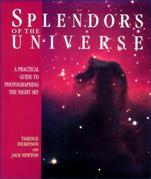 Splendors of the Universe is by Dickinson and Newton, published by Firefly. It is a wonderful and inspiring book as I further consider astrophotography. My sister gave me a newspaper, the London Free Press, from Monday 21 July 1969. The front page reads (of course): "Man on the moon." I'll have to protect this relic. I have very faint memories of watching the news live on TV at the time.